How come, from a bird’s eye view, Basel’s buildings are greener than those in San Francisco? 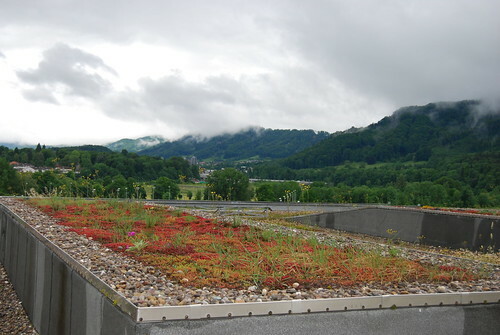 Turns out, the Swiss city has the highest area of green roofs per capita in the world thanks to a 2001 law stipulating that new or renovated unoccupied, flat roofs must be green. Thus the view from above. swissnex San Francisco, acting as a bridge between Switzerland and North America, wondered if some of Switzerland’s green wisdom could be cultivated in San Francisco. So, in March 2013, swissnex began an ongoing series around urban gardening, green roofs, and living walls aimed at connecting experts from the two regions on this issue. The series continues in June 2014 with a month-long program, Cultivating our Future, investigating man’s relationship to nature through the lenses of community, research, art, and design. The train is now pulling into the station. And if eagerness on the part of the city’s policy makers is any indication, then swissnex San Francisco is clearly helping the city get on board. One connection at a time. The dialog between Swiss and San Francisco green roof experts began in March 2013 at swissnex San Francisco with a lunchtime policy panel followed by a tour of San Francisco’s most impressive green roofs and living walls, led by landscape architect Lisa Lee Benjamin and Dr. Stephan Brenneisen, of the Green Roof Competence Center at the Zurich University of Applied Science (ZHAW). The enthusiasm of the discussion at swissnex motivated our team to curate a study tour of Swiss green roofs in July 2013 aimed at connecting North American experts with their Swiss contemporaries, and hopefully sparking a green roof revolution in the Golden Gate. Twelve participants were accepted on the tour including policy makers, urban planners, and landscape architects. After returning to San Francisco, Tam and SPUR convened a “green ribbon task force” of planners, architects, and developers to analyze current policy and make recommendations for a city green roof strategy. They published a report identifying barriers, opportunities, and recommendations to advance the state of green roof implementation in San Francisco. 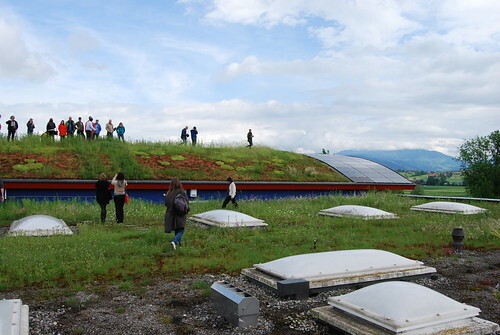 Green roofs are definitely taking root. swissnex demonstrated the Swiss green thumb in September, when we celebrated PARK(ing) Day with urban gardening workshops by Swiss startup VEG and the City, held in parking spaces in front of our office—temporarily transformed into an educational parklet. In October 2013, VEG and the City returned to present their company at the Cities Alive Conference, where swissnex also ran an academic panel, “Pushing Policy Forward on Green Infrastructure for Urban Resiliency,” and a poster presentation bringing the Swiss perspective and expertise to North America’s only green roofs and walls conference. The same week, at a special Cities Alive-themed NightLife at the California Academy of Sciences, swissnex helped share projects from rooftop farmers, bee experts, and vertical gardening startups along with ZHAW researcher Chiara Catalano on climate, and ZHAW student Dimitri Meierhofer on rooftop diversity. Also in October, Joslin and other members of the swissnex green roof study tour announced the establishment of the Green Roof Alliance to work in collaboration with industry professionals, government representatives, and communities to promote healthy and sustainable green roofs in California. We’re proud to have contributed to improving the San Francisco’s policy landscape for green roofs and walls and hope that the birds flying over this city will soon start seeing green, as they do in Basel. swissnex continues its green series in 2014 and we are working with the city’s Pavement to Parks Initiative to create a swissnex parklet at the end of this year! Testimonials from participants of swissnex San Francisco’s 2013 Green Roof Study Tour to Switzerland.